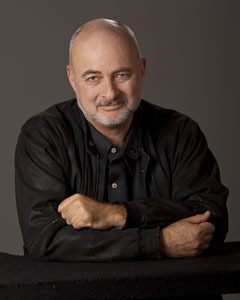 David Brin is a scientist, inventor, and New York Times bestselling author. His most recent books, Insistence of Vision and Chasing Shadows, use short stories to probe the limits of what's possible or probable. Brin's novel Existence explores how near-looming technologies may affect dangers and opportunities in coming decades - a topic that keeps him speaking before agencies like the CIA, OSTP, ODNI, Homeland Security, and many others. As a "scientist / futurist," he's keynoted about future trends for IBM, GE, Viacom, Google, Procter & Gamble, SAP, Microsoft, Facebook, Qualcomm, Cloudflare, the Mauldin Group, and Casey Research. David is seen frequently on television shows such as The ArchiTechs, Universe, and Life After People, along with many appearances on PBS and NPR. With books translated into 25 languages, David has won multiple Hugo, Nebula, and other awards. A film directed by Kevin Costner was based on David's novel The Postman. Other works have been optioned by Paramount and Warner Bros. One of them - Kiln People - has been called a book of ideas disguised as a fast-moving and fun noir detective story, set in a vividly original future; while a hardcover graphic novel - The Life Eaters - explores alternate outcomes to World War II. David's science-fictional Uplift Universe explores a future when humans genetically engineer higher animals, like dolphins, to speak.